In the second book of the Carve the Mark duology, globally bestselling Divergent author Veronica Roth reveals how Cyra and Akos fulfill their fates. 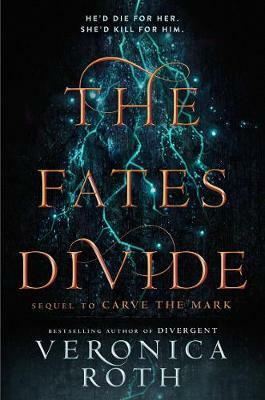 The Fates Divide is a richly imagined tale of hope and resilience told in four stunning perspectives. The lives of Cyra Noavek and Akos Kereseth are ruled by their fates, spoken by the oracles at their births. The fates, once determined, are inescapable. Akos is in love with Cyra, in spite of his fate: he will die in service to Cyra’s family. And when Cyra’s father, Lazmet Noavek – a soulless tyrant, thought to be dead – reclaims the Shotet throne, Akos believes his end is closer than ever. As Lazmet ignites a barbaric war, Cyra and Akos are desperate to stop him at any cost. For Cyra, that could mean taking the life of the man who may – or may not – be her father. For Akos, it could mean giving his own. In a stunning twist, the two will discover how fate defines their lives in ways most unexpected.